Teddy Bears Picnic Day is celebrated in the United States on July 10. 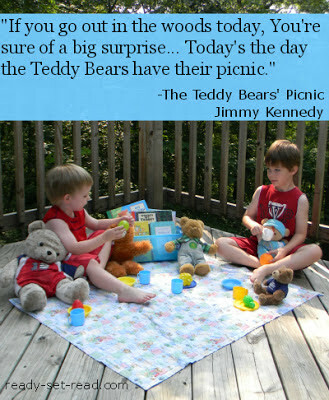 Teddy Bears' Picnic can be a fun theme to explore in preschool as well. 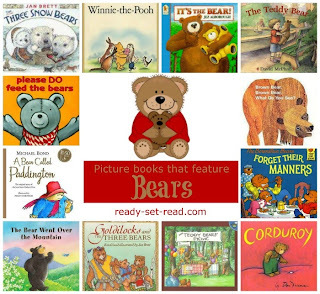 There are many picture books about bears or starring bears. Kids love to read about bears, and they love to read to their stuffed bears. A Teddy Bear's Picnic Day offers kids a chance to do both. Here are some of our favorite bear books for your picnic as well as some fun book activities and songs you might enjoy. This post contains affiliate links. Clicking on the image or the title will take to the book on Amazon. The Teddy Bears' Picnic includes the lyrics to Teddy Bears Picnic and is illustrated by Alexandra Day. It is my favorite version of this classic song. The illustrations are sweet and creative. You can also find the lyrics to Teddy Bears Picnic on DLTK's website. The Teddy Bear by David McPhail A little boy loses his teddy bear which is retrieved by a homeless man. The man carries it for a year and loves it. It is spotted by the boy on a park bench a year later. The boy faces the difficult choice of keeping his bear or letting the homeless man keep it. Such a deep book for preschool children-- yet somehow they are able to relate. Where's My Teddy? by Jez Alborough is the story of Eddie and a real bear. Eddie's teddy bear gets mixed up with a real bear's giant teddy bear in the woods. By chance, the two meet up... and scare each other away. The rhyming text, cute illustrations, and humor draws kids in. The story continues in It's the Bear! as Eddie and his mom take a trip to the woods. He tries to convince his mom of the bear he met in the previous book. She isn't convinced until the bear eats their entire picnic! My Friend Bear has Eddie and the Bear meeting once more; but this time, they form a unique friendship. It's fun to read these as a series, but each can also be enjoyed individually. Winnie-the-Pooh (Puffin Modern Classics) by A.A. Milne. Most of us grew up with this lovable bear, Winnie the Pooh and all of his lovable friends in the 100 acre wood. Although this is a chapter book, many preschool children can listen and enjoy the Winnie the Pooh books. A Bear Called Paddington by Michael Bond is another chapter book that can be enjoyed as a read a loud by young readers. In this story, a bear is found at Paddington station. Having arrived from Darkest Peru, he needs a place to stay and finds a home with the Brown family. The book explores the adventures of having a bear in the house. It's humorous and kids fall in love with this bear! Brown Bear, Brown Bear, What Do You See? My First Reader is a classic book with a repetative text. While it only features one bear, there are several other bear themed books by Carle. Put them all together to provide preschool children with good, clear illustrations of bears. You might encourage children to create their own artistic versions of various bears. Panda Bear, Panda Bear, What Do You See? (My First Reader) Polar Bear, Polar Bear, What Do You Hear? Big Book of the Berenstain Bears Berenstain Bears are some of my favorite bears. Whether teaching kids about manners or helping them when they are afraid of the dark, this is one loveable family you'll want attending your next teddy bear's picnic. Here are few of our favorite Berenstain Bears books. Goldilocks and the Three Bears by Jan Brett. Goldilocks and the Three Bears is a classic tale that immediately comes to mind when thinking of bear themed picture books. I love Brett's version of the classic tale because she is one of my favorite illustrators. Brett also wrote The Three Snow Bears which is the Goldilocks and the Three Bears version set in an Inuit indian village. Blueberries for Sal by Robert McCloskey is a classic story of a girl and her mother who encounter a bear and her cub while picking blueberries. We're Going on a Bear Hunt by Michael Rosen and Helen Oxenbury We're going on a bear hunt is a fun traditional chant. I love this picture book version of the chant. Helen Oxenbury's illustrations bring the story to life. After reading this story, try making bear cave cupcakes. Bake up a bunch of chocolate cupcakes, tuck a teddy graham inside each cupcake, and cover with frosting. Kids can bite into the cupcake and find the bear in the cave. 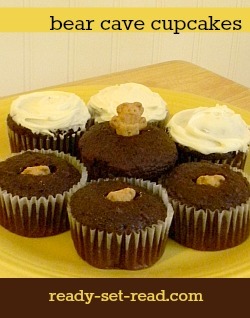 Bear Cave Cupcakes are the perfect dessert food for your teddy bears' picnic. Please Do Feed the Bears is a wonderful book covering both teddy bears and picnics. In this story, a young boy named Percy sneaks his stuffed bears into the family cooler. When the family arrives at the beach with a cooler full of stuffed bears, Percy has to be creative and ask passersby, "Please DO feed the bears". We created a Please DO Feed the Bears Game with this book. "The Bear went over the Mountain". They are easy for kids to remember and reenact. The Bear Went Over the Mountain Iza Trapani's book, "The Bear Went over the Mountain" could also be fun to act out. In this book, the bear goes over the mountain to see what he can see, smell what he can smell, taste what he could taste, touch what he could touch, hear what he could here. It's a fun and memorable story that kids love! "Bears" from the album Slugs and Bugs and Lullabies This is a super silly song that kids love. The description of bears in this song is super funny to kids. The bears don't wear underwear, socks, jammies or gloves-- no, these are real, ferocious bears! They are the kind with "sharp teeth and paws and killer claws that will catch you and eat you up". Kids are delighted by this hungry old bear. They are especially delighted when a parent pretends to be the bear and chase them around the house while singing! Teddy Bear Playtime from the album So Big - Activity Songs For Little Ones by Hap Palmer. This is a fun action song to do with your teddy bear. 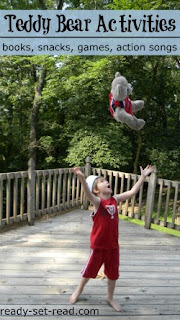 Kids follow simple steps like, "Throw your teddy bear, and catch, turn around, turn around, jump, jump, jump." There are also directions to put your teddy on bear on various body parts. My boy's favorite part of the song is to "put it on your head and walk around the room". They think that's very silly and have no clue they are learning! Would you like more books by theme? This summer I've been working to organize picture books by favorite themes. There are books about back to school, me and my family, colors, shapes, gardens, dinosaurs, and community helpers. Check back on July 22 as I wrap up my preschool themes series with Outer Space books. Click here to find the book lists by theme. Thanks for the twitter follow! I had to come visit your blog -- it's terrific! 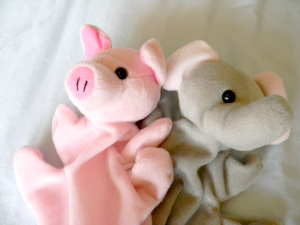 What a fun post about Teddy Bear Picnic Day -- you featured so many of the books I shared with my two little guys (now big guys). Awesome to "meet" you Jeanne. I love when Moms comment about their big guys. It just reminds me that all these things we do are creating memories! Totally makes it worth it. Look forward to connecting with you in the future. Lovely list Jackie! I love linking teddy bears and picnics too! Bears are so adorable! It is so hard to choose my favorite among these books. Love the cupcake recipe as well.